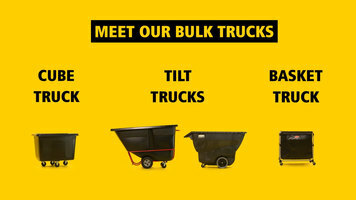 Easily collect, sort, and move materials with Rubbermaid bulk trucks! They offer a cube truck, basket truck, and tilt trucks to fit a variety of needs. The tilt trucks allow you to move dirt and debris. They have ergonomic handles and are made strong for long-lasting, heavy-duty use. The cube truck can hold a variety of items from trash to supplies, and can be paired with dome lids to conceal the contents. You can also add a spring platform to make unloading easier than ever. The basket truck folds up for compact storage and comes with a variety of color coded ribbons for easy classification. There are also optional covers available to protect the contents. Use Rubbermaid bulk trucks to easily collect, sort, and move a variety of materials! 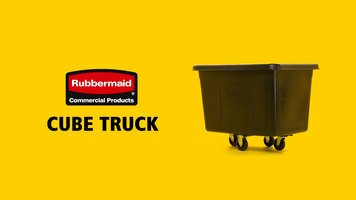 Whether you're looking to transport debris, trash, or supplies, Rubbermaid has a truck to meet your needs. Introducing the Rubbermaid Cube Truck! Built for tough jobs and built to last, these trucks feature domed lids to conceal supplies. Inside is a spring platform to make unloading easy, and on the bottom the diamond caster pattern makes for hassle-free handling and maneuvering. The Cube Truck is built to outlast and outperform! Learn more at rubbermaidcommercial.com. With the Rubbermaid Cube Truck, loading and unloading supplies is fast and simple! From its domed lids to its interior spring platform, this truck is equipped with the features you want and the durability you need! Find out more by watching this short video. This Rubbermaid FG461800BLA black cube truck features an impressive 20 cu. ft. capacity that allows you to easily transport up to 600 lb. of material and boasts a unique spring platform that automatically brings the truck's contents to a convenient working level for safer and less stressful handling! 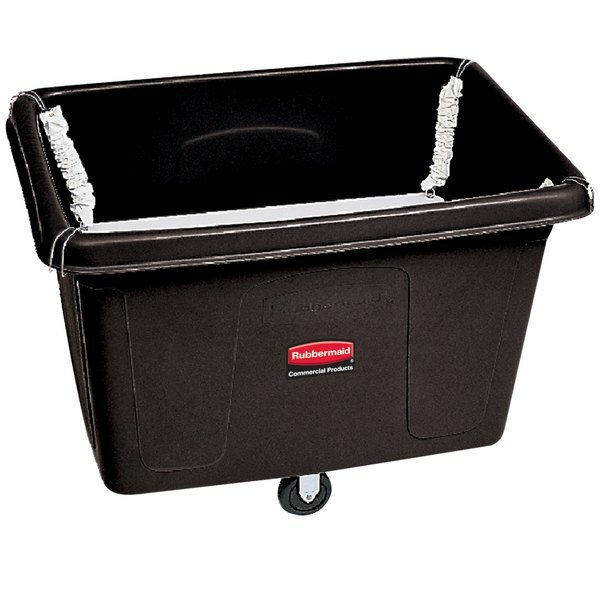 A great way to transport products for food preparation, packaging, or storage in virtually any facility, this truck's metal frame provides durable support to heavy loads and rests on reliable 5" casters arranged in a diamond pattern for easy maneuvering around tight corners and down narrow hallways.